New Mexico plans to retrain fossil fuel workers as part of its transition to 100 percent carbon-free electricity. Last year, New Mexico got nearly 48 percent of its electricity from coal-fired power. According to the Energy Information Administration, 33 percent came from natural gas. Last Friday, Governor Michelle Lujan Grisham signed a law that mandates 100 percent carbon-free electricity by 2045, with at least 80 percent from renewable energy. It also lays out a process for closing the state’s large coal-fired power plants through a securitization process that allows Public Service Company of New Mexico (PNM) to recover costs from ratepayers. In addition to those provisions, advocates have lauded the bill as an example on how to transition fossil fuel workers to new jobs. 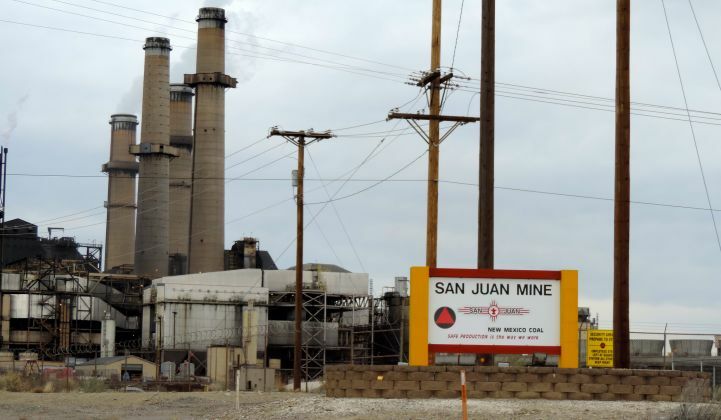 It includes about $40 million for economic development, severance and retraining for people who will lose their jobs after the closure of facilities such as the coal-fired San Juan Generating Station, planned for 2022, and the Four Corners Power Plant, slated for 2032. A portion of the money will be distributed through three state-administered funds established in the law: the Indian Affairs Fund, the Economic Development Assistance Fund and the Displaced Worker Assistance Fund. Starting in 2026, the bill also requires that 25 percent of workers employed during the construction of new electricity generation facilities come from to-be-established apprenticeship programs. “By simultaneously committing the state to a clean energy future, while also supporting the workers and communities adversely impacted by that transition, the bill really wrestles with the reality of this transition,” said Julie McNamara, an energy analyst at the Union of Concerned Scientists. But as the process to determine how to spend that money begins, tensions around the bill’s passage remain fresh. Grassroots groups claim the "process was bogus"
The bill garnered support from large environmental groups, labor unions and the president of the Navajo Nation. But throughout the process and in the wake of its signing, other indigenous people — New Mexico is home to 23 sovereign indigenous nations — and environmental justice groups said its drafting process was not inclusive. Ahead of the bill’s passage, dozens of grassroots indigenous groups and supporters signed onto a letter opposing it. Tribal lands make up 11 percent of New Mexico’s total acreage and are home to significant energy infrastructure. According to a 2017 report from the University of New Mexico School of Law, tribal lands had 2,762 oil and gas wells and 245 oil and gas leases. The Navajo Nation had over 500 uranium mines as well as coal development. Many of the workers who will be impacted by a transition away from fossil fuels are citizens of indigenous nations, particularly in the state’s northwest corner where San Juan Generating Station and Four Corners Power Plant are located. Moving forward, some community advocates said they’re concerned the implementation of the bill’s training and apprenticeship initiatives will also fall short in including community input. Now, the state has to work to make sure concerns about an exclusionary process don’t seep into the implementation of transition programs as well. Additional community engagement is "critical"
That’s something the state government says it's committed to doing. State representatives who spoke with Greentech Media said their first step will be engaging affected communities, including indigenous community members and representatives from tribal nations and pueblos. Several state representatives headed to San Juan County this week to begin outreach. Bill McCamley, the state’s Secretary of Workforce Solutions, said no decisions will be made on administering funds prior to more community engagement. “I can’t really tell you what next steps are, because we need to figure out what the community wants,” he said. PNM, which owns a 562-megawatt share of the San Juan Generating Station and a 200-megawatt share of the Four Corners Plant, echoed those sentiments and acknowledged “a lack of consultation” during the bill’s drafting. A "just transition has to be about environmental justice"
Smith called for environmental impact studies and community-led needs assessments to determine how best to transition the economy in impacted areas. She also said the process needs to include rigorous tribal consultation, with meetings held within indigenous nations and using translation services. Ultimately, she said, the crafters of the bill need to realize that some impacted communities are without the “energy privilege” that others in New Mexico take for granted. To make sure the transition funds serve communities, the Energy Transition Act included the convening of a community advisory committee in each affected community, which will include representatives from indigenous nations, Navajo Nation chapter houses and displaced workers. The law also outlines a public input process requiring three meetings in each impacted community. How those efforts pan out will be significant, because the state has already been held up as an example for just transitions nationwide. And concerned stakeholders say the state has work to do.